60 Minutes to Winning movie is a tutorial that shows complete theory of card counting technique. It shows techniques that were used by MIT blackjack team, which is considered as the best and most famous card countering team in the world of blackjack. This is a story of students who have beaten all popular casinos in 1994. Their secrets on how they did it are shared within this movie. The champion of World Series of Blackjack in the year 2004 who is Mike Ponte is the host of the instructional DVD. It was released in 2005, but the DVD is still available today. 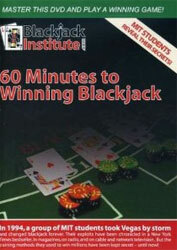 Inside this DVD you will learn diverse aspects of blackjack game. It will teach you blackjack rules and basic strategy that can help you to win a game. The must of every good player is basic knowledge about the game. You need to master the basics in order to go into the next level. It will show more about betting strategies, running count, true count and deck deception. No matter what is your level in playing blackjack, this will surely help you increase your skill level. There are several chapters that can help you hone your skill and improve your game play. Some people who have watched the DVD think that it is too easy to understand especially for players who already know more than just the basic of the game. Some are excited and find the DVD very useful for them especially those who want to learn more about card counting. Some are fans of MIT and they want to watch how this group of young players managed to win big in diverse casinos. There are also those who believe that 60 minutes is not enough to understand everything about blackjack and card counting. The MIT blackjack team was organized in 1980 with group of post graduate students from Massachusetts Institute of Technology. They have played blackjack by using their knowledge to make money out of this famous casino game. The main ingredient of their success was card counting as well as team efforts pulled together. In 1990s they won millions of dollars and they have been banned in many casinos, but they continue playing using disguise. One of the members of MIT named Ben Mezrich wrote a book entitled Bringing Down the House. This book became a bestseller at once. Besides, it became the basement of some of the famous movies such as The Last Casino and 21. If you are fond of playing blackjack, then you will surely want to watch this DVD. This will increase your knowledge on how to play blackjack with an aim of winning every game. It is good to know that this DVD is widely available online through diverse websites. You can easily buy it and enjoy watching and learning the most useful and win-leading strategies. Do not forget to use some of them while you are playing blackjack and you will see how huge your winnings became.